The story of little Émile Jutras brings back a lot of memories. In 2002, two-and-a-half-year-old Émile suffered from heart failure and was placed on the Berlin Heart, making him the first child in Canada and the youngest child in North America to receive a mechanical heart as a bridge to a heart transplant. 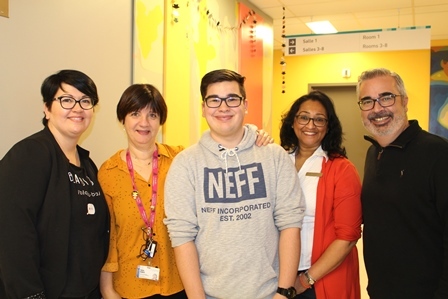 On December 13, he turned 18 and officially transitioned to the Heart Failure and Transplant Clinic at the Royal Victoria Hospital of the MUHC. The Children’s Complex Care team gathered together to say goodbye with a party and cake. “We will miss him, but he’s in very good hands,” says Dr. Hema Patel, Director of Complex Care Service at the Montreal Children’s Hospital.